Essays by Michael Rotondi. Introduction by Charles Correa. 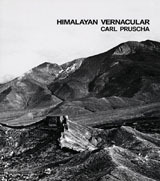 For ten years, Austrian architect Carl Pruscha was stationed in Shangri-la, or as close as you can get to it. The UNESCO consultant for regional planning in Nepal from 1964 to 1974, he presided over the opening of Nepal, Bhutan and Tibet to the rest of the world, and in this passionate Pruscha manifesto, illustrated with his own photographs, argues for preservation of vernacular architecture. Paperback, 9 x 10.5 in. / 160 pgs / 40 color.